The exact number is not known, but it is believed that millions of people died in German Concentration Camps, during the course of WWII. Many of the liberators of the camps, were not prepared for what they say when they arrived. The photos on this page, are not for those with weak stomachs. While these photos are shocking, I purposely chose not to include many photos that would make the photos on this page look tame in comparison. The physical pain is obvious, but it is hard to imagine the emotional pain that families caught in these terrible places had to endure before their deaths. It is very sad what human beings can do to each other. These huge piles of clothes, belonged to prisoners at Dachau Concentration Camp. Photo, April 30, 1945. This large group of prisoners at the Ebensee, Austria camp, was liberated by the 80th Division. Some reports said that the camp was used for scientific experiments. Photo: May 7, 1945. These men were slave laborers at Buchenwald concentration camp near Jena. They were liberated by the 80th Division. Photo: April 16, 1945. The U.S. Ninth Army liberated this group of prisoners at the German concentration camp at Wobbelin. The prisoner on the ground broke into tears when he found out he would not leave with the first group to the hospital. Liberated prisoners at the Mauthausen concentration camp welcome the 11th Armored Division. Here, stronger prisoners at Wobbelin Concentration Camp, help weaker prisoners into a truck, to be transported to receive medical care. These two men were liberated from the Lager Nordhausen, Camp. Nordhausen was a Gestopo Camp. 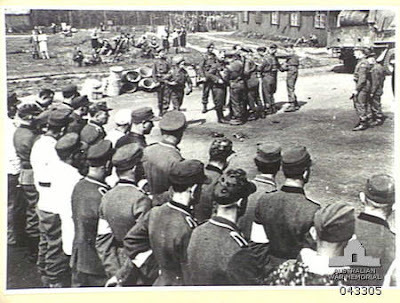 Prisoners at the prison camp at Belsen, Germany. Photo taken 4-28-1945. 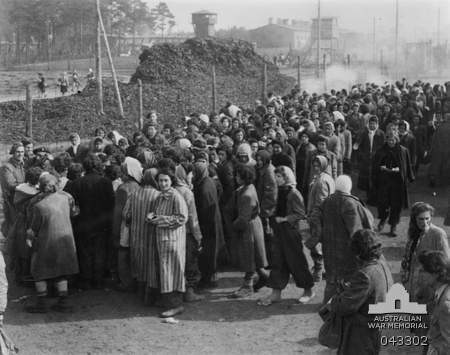 Prisoners at Belsen, Germany Prison Camp, who were liberated by British Troops, on 4-15-1945. German soldiers being searched, by the British, at Belsen Prison Camp, 4-15-1945. 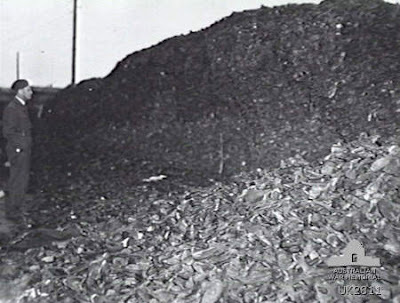 This photo of an enormous pile of shoes was taken at Belsen Prison Camp, April 23, 1945. It is unimaginable, but each pair represents the loss of one human life. General Dwight D. Eisenhower watches as prisoners demonstrate how they were tortured at the concentration camp at Gotha. Photo April 12, 1945.
why does religion cause so much hate in the world. "It can't happen here" YES it CAN! IF we forget and let our Children remain IGNORAT of the fact that FREEDOM isn't FREE! Religion its self doesn't cause hatred. Most religions teach you to turn the other cheek and for give your transgressors. It is simple minds and mean spirited people and their intolerance toward others who use religion to exercise their hatred. They wrongly interpret religious texts for their own means. Very few religions preach convert or die. What religion caused the Holocaust? Hitler and the Nazis were dedicated Darwinists, just like the monsters in the Soviet Union. Atheistic communists and socialists caused the 20th century to be the bloodiest in history. Read From Darwin to Hitler by Professor Richard Weikart and inform yourself. Luther wrote in his book "On the Jews and their Lies" 1943 - "set fire to their synagogues or schools"
My father fought in ww 2 and made sure we knew about the atrocities he witnessed. He fought in Germany.He was an alcoholic when he died and I always believed he became that way because of these very images he brought back with him.They were trapped in his mind to the end of his life. We now judge the people back then- which countries opened their borders to accept the Jews? And which didn't? In the future we will be judged also for how we treat those in need. The Syrians are being exterminated, who is helping and who is turning their back? Man has dominated man to his injury.